From the rugged beauty of its Atlantic coastline to the turquoise waters and scenic tranquility of its western shores, this "island of eternal summer" blends the rich heritage and culture of Great Britain with Caribbean style and hospitality. 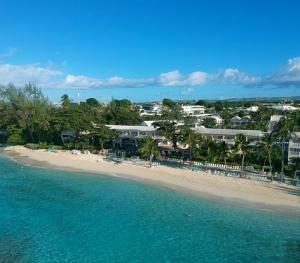 Grand Barbados Beach Resort is located on the shores of Carlise Bay, one of the finest beaches on Barbados. Spend your day basking in the tropical sun, then plunge into the crystal waters of the Caribbean. Grand Barbados Beach Resort is strategically located on Carlisle Bay and caters to both the corporate and leisure traveler. Hotel offers snorkeling, scuba diving, water skiing, swimming, and sunfish sailing. Rooms have private bathrooms with tub, shower and marble or granite floor. Hotel features a dive shop, convenience store/gift shop, boutique, beauty salon, luggage storage, sight tour & car rental can be arranged, foreign currency exchange, photocopying service, telefax service, 24 hour taxi service, 24 hour security, business centre with 24 hour Internet access, modern fitness centre and three conference rooms with a total of 4,184 sq. feet of space. Hotel offers additional services at a cost including: thirty-six (36) photos, including an album and negatives; video of the ceremony; steel pan music for one hour; guitarist during ceremony and toast; beauty services and massage; gown and tuxedo rental; horse and carriage ride; limousine service at an hourly rate. Included in this wedding package is a decorated arch, bridal bouquet and buttonhole, wedding cake, bottle of champagne, witnesses if required, one hour cocktail reception for up to six (6) persons, and special rates for overseas guests. This fee does not include the marriage license fee, minister's fee and stamp duty. Offers a casually elegant atmosphere overlooking the beach. The sumptuous breakfast buffet is the ideal start to a day in paradise. The Sunday Sunshine Brunch and Friday Bajan Lunch Buffet are especially popular with the locals. Then the sun goes down, the Pier I is the perfect spot to enjoy our Chef's creations of international and local specialties as the warm breezes and starlit night surround you. Specialty Nights include Monday Bar-B-Que, a Lobster Feast, and a Caribbean Fish Fry. Serves up your favourite tropical refreshments in our intimate seaside setting.